View any email sender's RedCritter profile directly in your inbox. Send anyone an accolade without ever leaving your email. 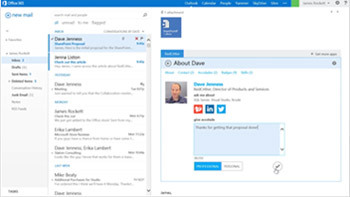 Compatibility: Requires Office 365 Email, Outlook 2013 or Microsoft OWA for iPad or iPhone (iOS). "Office 365", "Outlook 2013", "Enterprise Gamification", "Employee Engagement"
Did a co-worker, customer, business partner or friend just do something great? Use RedCritter Accolades to send them an accolade right from your inbox. You can also view any email sender's RedCritter profile in your inbox. Create your own RedCritter profile to share your social links (LinkedIn, Twitter, Facebook and more) and accomplishments with others. 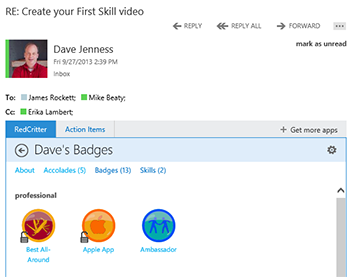 Learn how to add RedCritter Accolades to your Microsoft Outlook account.